Currently a 0.3 acre vacant site bound by Century Street and Albertville Drive. Arterial Developments Ltd received planning permission (Z/2006/1320/F) in November 2006 to develop a four-storey scheme comprising 4no. ground floor retail units with 38no. apartments above. The application was approved in November 2006 although no development took place. Lavelle & McAlinden and Coogan & Co Architects submitted a planning application (Z/2013/1613/F) in June 2007 proposing 38no. apartments over 4no. retail units. The application was approved in November 2007. Construction commenced in 2009 but ceased during 2010 as Lavelle & McAlinden Ltd was placed into administration. The foundations, underground car park infrastructure and steel portal frame to the front of the site were constructed. The partially built development site was placed on the market inviting offers around £400,000. This was later reduced to £195,000. OBC Developments and Coogan & Co Architects submitted a planning application (Z/2013/1140/F) in October 2013 proposing 34no. apartments over 3no. ground floor retail units. The application was approved in December 2013. OBC Developments and Coogan & Co Architects submitted a planning application (Z/2014/0658/F) in May 2014 proposing 12no. townhouses, 1no. apartment and 1no. retail unit. The application was approved in April 2016. The site was placed on the market by Simon Brien Residential during summer 2016; described as a development opportunity site inviting offers in the region of £249,950. 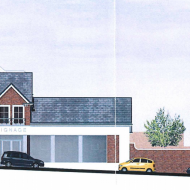 OBC Developments and Coogan & Co Architects submitted a planning application (LA04/2016/1185/F) in June 2016 proposing to change the approved retail unit to 2no. ground floor apartments. The application is currently pending a decision.